Stroll north from the Notting Hill Gate end of Portobello Road and after about 20 minutes, you'll come to Golborne Road. 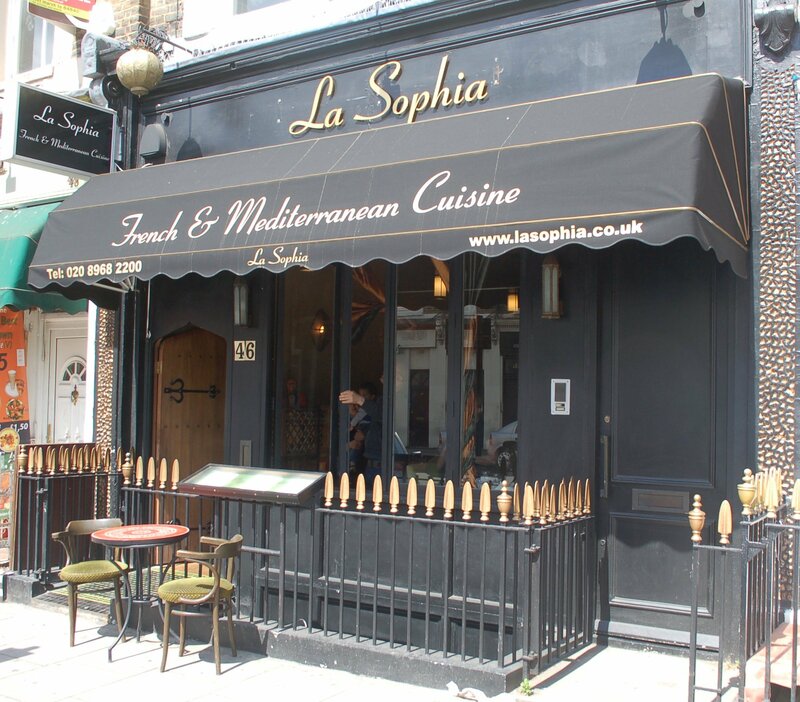 Turn right towards the modernist 31-storey Trellick Tower – loved by some hated by others - and walk past the bric-a-brac shops, street food stalls and pavement cafés and you'll come to a gourmet restaurant at 46 Golborne Road, offering French and Mediterranean cuisines, La Sophia. Step through the front door and you'll enter a room that combines Middle Eastern styling with Portobello chic. Subdued lighting, timber detailing and distressed walls create an atmosphere that's as intriguing as it's relaxing. This family-run restaurant is named after one of the children of the owner-managers, Ali and Sousan. They both have Palestinian heritage, although Sousan's slight twang confirms the fact that she was raised in Australia. Sousan looks after the back-of-house, while Ali fills the role of head chef. Ali's previous work has included a spell with Gordon Ramsay and he's worked in top-class kitchens in cities around the world including Tel Aviv, Toronto and Amsterdam. Contemporary French cuisine, heavily influenced by the cooking of the Mediterranean, is the order of the day here, prepared with market fresh ingredients and a large helping of panache. There's a prix fixé menu offering two courses for £19.50 or three for £25 (prices at August 2012), both representing excellent value. Choose from starters like Jerusalem artichoke soup with roasted shallots and white truffle oil, and mains such as stuffed free range chicken supreme with mushroom duxelles, creamy mash potato and truffle velouté. Finish by sating your sweet tooth with chocolate mousse cake with chocolate sorbet. If you're in the mood to splash out, opt for the à la carte menu where you'll find starters like grilled quails with crispy quail eggs, quinoa and wild rice salad and lemon thyme jus. The mains include some real classics from the modern Mediterranean kitchen like roasted saddle and confit leg of rabbit with grilled polenta, summer vegetables & grain mustard sauce. Vegetarian options such as braised Puy lentils with truffle spaetzle, tomato concassé, sage and caramelised onions are also available. Service that's attentive rather than stifling, food that's prepared by someone that really understands contemporary French cuisine and an informal atmosphere with none of the stiffness so often associated with fine dining: just some of the reasons to make a reservation at La Sophia. Why? Delightful French-Mediterranean restaurant with Middle Eastern influences on Notting Hill's groovy Golborne Road. 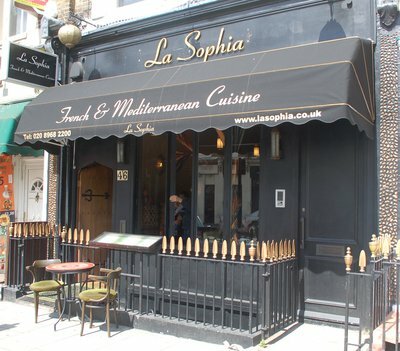 We headed to La sophia after a stroll on Portobello road. Lovely people and best of all the food was excellent!! !